It is a tent-made Mosque in Lesvos created by the Green Gate Trust voluteers , announced through facebook on January 10, 2016. 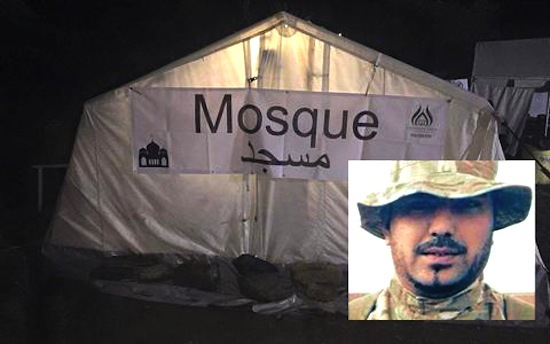 A British Muslim Volunteer of Green Gate Trust announced that he completed it, writing also on his Facebook timeline that religious lessons were about to start within the next days in the mosque. The makeshift tent has the inscription «Mosque» and stands near the Reception Centre for refugees in Moria. The case has already been set under the inspection of the Prosecutor and is thought as seriously concerning for Lesvos' Municiaplity auhtorities . In the interior the tent-mosque is fitted with carpets and coffee tables with books on praying Muslims refugees. The British Muslim Volunteer said that he is volunteer who arrived in Lesvos to offer its services to NGOs and was about to leave from the island to England in the next two days. However, there are photos on the personal page on twitter, showing him in military uniform and weapon. wrote Ethnos newspaper in Greek language. The issue got, indeed in the Greek island ,serious dimensions. The police filed a folder with photos and information and sent it to the prosecutor of Lesvos in Mytilene who started the research. The Municipality of Lesvos characterized the Mosque arbitrary while the deputy mayor of Technical Works, Efstratios Jimis said that any use of it, as not licensed, is forbidden . Greekreporter wrote on Jauary 15, that the Muslim British citizen is seen in photos dressed in an army uniform and carrying a rifle, and posted the photo below that follows, adding that there is no question that the future of Europe is being redesigned at this very moment as a result of the influx of millions of migrants and refugees from North Africa and the Middle East but Greece is simply in no position to accept many of these people. There are three Muslim houses of prayer that are operating legitimately after an initiative by the Greek state to address the absence of a mosque in the capital, which is in violation of European Union regulations governing the right to worship. The issuing of licenses started in 2014 and so far three mosques have been successful: Hamza,which started operating in an apartment in central Athens this summer 2015 and is mainly used by Athens’s Bangladeshi community., another in Piraeus used by Greek Muslims, and a third in western Athens, which is used mainly by the Pakistani community. The licenses are issued to the mosques’ caretakers, prominent members of their respective communities and longtime residents of Greece. These men are not proper imams as they have not been formally trained, but they manage the space and also act as the state’s “eyes and ears” in the Muslim community. A few months ago, for example, ACCORDING TO KATHIMERINI ARTICLE 26.11.2015 ,the caretakers wrote to the Greek authorities informing them of the “odd” behavior of a “preacher” at an unlicensed mosque who was inciting Sunnis to “holy war” against the “apostates” of Islam. The man was arrested and deported.